Hello everyone, a few years ago you guys helped me fix my oven which had a bad relay in the switch board saving me hundreds of dollars, and the oven is still working great! So I want to say thanks again (Especially you Reg US Pat Off)! I have been lucky enough to not have any other major issues that I can not figure out until recently, when my Frigidaire humidifier (which is about 2 months old) stopped working and is displaying a "F0" code. I called the company and they said to make sure the outlet supplying it is accurate (it is) and that is all they can do. They can refund me my money, but I got it on a very good deal so I won't be able to buy another one (assuming I even wanted to go with the same brand). I did a lot of googling about this code and I was surprised at how little information there is about it on the internet. There aren't any sites/blogs that I could find where people tried troubleshooting it so I came here to learn from the masters themselves! So, to the details. I turn it on, the fan turns on. A few minutes later the compressor turns on. Then about 45 minutes later the thing displays the F0 code. The model number is FFAD7033R10, it is a 70 pint Frigidaire dehumidifer. This Link to a manual online gives a very brief description of the error code F0. Lastly, I am not sure if this is relevant but I had it hooked up to a KILL A WATT EZ P3 thing my Dad gave me which will show me the approximate electricity pulled so I can calculate how expensive it is to run. I was just curious how much of a beast this thing is (it wasn't at all, if I recall it was a little over a dollar or so a week). I have no idea if this thing might have been causing the issue. Not being hooked up to it though, I still get the F0 code. Any advice on how to troubleshoot this would be greatly appreciated. Also, if you'd need any additional information just let me know and I'll be happy to supply it. Thank you in advance!! Did you meter the outlet voltage? Have you tried running it in a different location? Is the float switch working, is the fan blowing, do all of the control buttons work? Thank you very much for responding! Yes, I checked the outlet voltage, and its fine. I did move it to another outlet in my basement and also upstairs, and I still get the code. The floating switch works, the fan blows and the control buttons work. I did a bit more troubleshooting, and I'm thinking I'm getting the F0 not due to a voltage issue but a temperature issue. I took the back off and let it run while hitting it with a infrared temperature gauge. The back coils never went below 70 degrees. I also noticed the air that was being vented out was always room temp and before when it worked it was much warmer. Lastly, I noticed that with each cycle of the compressor, it became hot hotter and hotter. After a few on/off cycles it was 130/140 degrees. It took about 30 minutes for it to get to that temperature. The cooling coils (I assume they are the first ones past the air filter) were still at 70, except one tiny section, which had frost on it. I turned it off and got my phone and by the time I took two photos the frost already melted. So I put red circles in the photos where it was. It was just about 2 inches of tubing at the most. I also marked where a tube that terminates was cold (labeled in both photos). Both photos are pretty similar, but I wasn't sure if either gave a different/better perspective to a trained eye. One last observation is that I noticed rust where the water drips into (the white pan under the red circle) and also a bit of rust in the collection bucket. You described my problem exactly in my 70 pint dehumidifier. I also had rust at the bottom of the coils. I had the exact code, F0, for the same model Frigidaire dehumidifier. I pulled out a thermal sensor, and cleaned it and reinserted it and it began working. I don't know if it was a coincidence or I found the problem. You can see it in the picture above. It is right in the middle where the bottom blue arrow is, where the silver tab is. Pull out the black cable and clean the copper sensor. Make sure the inside of the tube is clean. Make sure you don't drop the silver tab and lose it. Good luck. After I did this it started working. Once you get it running you will notice with the back cover off that the bottom inch of the coils ice up. It eventually melts but the water rusts the coil holders on both sides. This is why you see the rust stains in the bucket. I don't think it's a big problem. It was something I noticed after it started working. Thank you very much for your reply! Was your thermal sensor dirty at all? I did take mine out and cleaned it with rubbing alcohol and put it back in. It was very clean though, so I'm not sure that did much. I turned it on and its been running for about 30 minutes and its the same deal so far. Condensation at that one small elbow and nowhere else. The compressor is 184 degrees. Any more advice? Or anything else I can do for troubleshooting? If it is trash, is there anything worth scavenging off it before I junk it? I figured at a minimum I could take out the humidity sensor. Maybe the temperature one too either for a fun project in the future or in case I get another one and something breaks on it. Thanks again in advance! The sensor did look clean but I used a little steel wool on it and made it shiny. I used a tiny piece of rolled emery cloth for the inside of the sensor mount. It's been working fine for 24 hours. I decided to pull the sensor out and run it unattached to see if the problem would come back. An hour later there was a F0 code! I reattached it and it is working again. So I'm sure that was the problem. So give your sensor another try. I don't think alcohol is a good cleaner for copper. You really have to use something stronger. Brillo work, too. Thanks a lot for your continued help! I had a busy weekend, but I was able to check things out just now. I don't have any steel wool so I used a dremel with the steel brush attachment. You are right, that little sensor does clean up pretty nicely. I then used some 600 grit sand paper for the tube. Turned it on, and no difference. I wiggled the sensor and even held it next to the vertical closed off brass tube which gets cold (labeled in the photos above) and it didn't have any effect whatsoever. Should I try heating up the sensor somehow? Anyhow, I'm a little confused as to why I only get condensation at that one small elbow and it seems to stop right where the tub goes into the coils. So I'm a bit stuck again on what to do next. Does anyone know how to take this thing apart so I can get to the second control board on the top of the unit? I can only take the back off and even after removing all of the screws I can't get the front open - from the front. I wonder if I need to take all of the coils off and the compressor to get to the front, which I'm not even sure I can do. If I could get to the front electronic board I could maybe test the sensor to see if its functional. From the schematic, it loos like there is a switch with the sensor, so I'd be able to test the switch too. I just don't know how to get to it without tearing it apart. Helen, if you are up for it, I wonder if when you take the sensor out if you only get frost up to the same point as I do. If you get frost all along the bottom, then I don't think we have the same issue. Don't worry about it though if your unit is working and all put back together, its not worth the trouble. If this unit is low on refrigerant, it will not frost the entire coil... If the compressor runs, but no frost = dead duck. My dehumidifier is still open to work on it. I pulled the sensor out of the tube. That little elbow iced up but it got an F0 code. It seemed to me that the sensor works by detecting cold. The trouble was that the little sleeve didn't seem to get that cold so I would sometimes get an F0. Cleaning it made it work better but I did get an occasional F0. So I took the sensor out of the sleeve and clipped it to the icey elbow using an alligator clip. Well, it worked fine. I no longer got icing at the bottom of the condenser, no F0 codes, and a really dry room. Maybe you just need to try attaching the sensor to that elbow. I need to figure a way to make a more permanent attachment. Thanks Hiroshi. My only thing is that its not that the coils don't completely frost up, but its it frosts up only to the point of where it enters the cooling coil. Immediately after that point, its room temp. Its not a ramping down of temperature. I can't understand how a lack of refrigerant would cause such a discreet end point of the cold temperature. Thanks again Helen. Of course, you reply immediately after I put in an order for a new one Isn't that how things always happen? I'm more than happy to continue to tinker with mine, so I'll try attaching it to the cold elbow. One thing is I realized the top front is held on by tabs, so I was just being too gentle. If you jam a paint scraper in there and lift with enough force it pops off. I'll have to try the sensor next to that icy elbow. I wonder what is wrong with our units that is making us circumvent this error code? 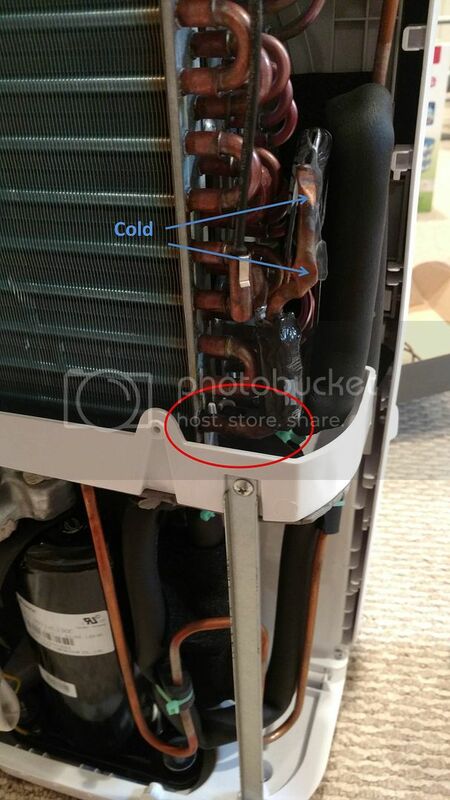 Should the coil be getting cold up to the sensor and ours isn't due to a blockage/partial blockage in the tubing or something? Or, are our units leaking refrigerant and this trick will just prolong its life a tad longer? I'll see what happens after attaching the sensor to the cold elbow. I can't understand how a lack of refrigerant would cause such a discreet end point of the cold temperature. Yeah, what Hiroshi said. 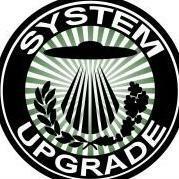 Sounds like you have a system problem, either a leak or a restriction. Either will cause the symptoms you're describing, not enough refrigerant entering the evaporator. I had the exact symptoms as Rjkd12, namely, icey elbow, frost covered bottom of evaporator, and F0 code. I highly doubt we both lost refrigerant. Once I attached the sensor to the cold elbow, my dehumidifier quit failing. I plan to permanently attach it with small cable ties as soon as I buy some. I'll post a photo if someone would let me know how to post a photo. What Hiroshi and Brew Hobby Tech said makes sense to me. I also believe that yours works after moving the sensor, Helen. Do either of you (or anyone else) have any possible explanation as to why moving that temp sensor allows Helen's to run? I can try to do that testing on Thursday this week. I need to reassemble it. Regarding posting a photo, I just signed up for a free photobucket account and put the link here. Moving it to a frosty area will make the sensor colder and may avoid the error, but won't necessarily make the unit operate properly... If the coil is not cold enough to freeze the passing humidity out of the air, it won't be de-humidifying anything very well, if at all. My dehumidifier is still working although as others pointed out it may be low on refrigerant but I have no way of knowing that. Nevertheless, the room is dry and water is accumulating in the bucket. If refrigerant is leaking then eventually it will fail. But I'm leaving the sensor where I put it until that happens. That little elbow still ices up so I know there is at least some refrigerant in it. The humidity meter I have and the dehumidifier both read about the same (50%). Any dehumidifier evaporator coil that is frosting AND is not in too cool a room AND does not have airflow blockage IS already low on refrigerant. I came here looking for an F0 magic decoder and suppose that it means that sensor detected suspiciously wrong temperature. Don't feel like tearing apart this dehumidifier, most recent of 3 to fail from lost refrigerant. This is the first that reported anything; others simply continued running without dehumidifying. Hiroshi-san, I think you are wrong on the F0 code. It is not a voltage or refrigerant loss problem. 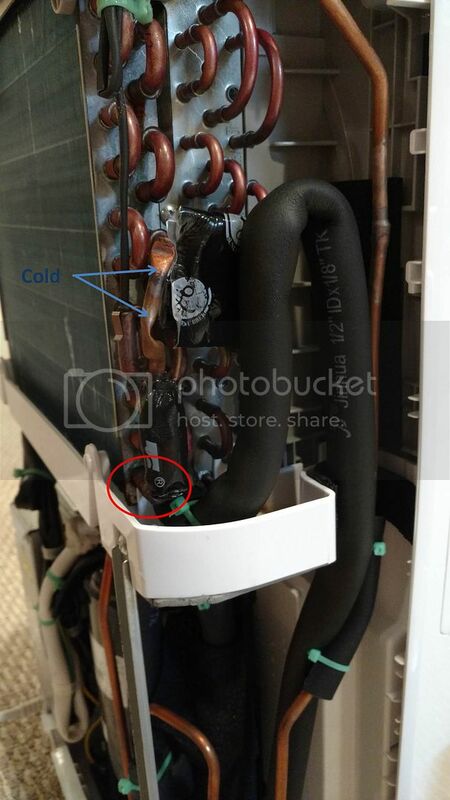 I moved the sensor, the one under the bottom blue arrow in the lower picture above, to the copper elbow under the red circle. I wish I knew how to insert a photo so you can see how I fixed it. My dehumidifier has been working fine since last year without any more trouble codes. The bucket fills with water and the room is dry. It no longer drips rusty water either, and there is no more icing on the coils. It is clearly a design problem. The sensor needs to be located as close to the bottom of the coils as possible. I used small cable ties to attach it. That is the Frigidaire published meaning for the code F0 Helen, there is no mention of refrigerant loss in my previous post, the codes are a guideline and often are not the only answer to what is happening, but it is a starting point. I am having a similar problem with my year old Frigidaire 70 pint dehumidifier, except that my condenser coils do not cool at all. On CO mode the fan comes on, then after a few minutes the compressor kicks in. After 45 minutes or so it shuts down and displays the FO error code. I have 124 volts at the outlet (a heavy duty contractor grade power strip). The room is roughly 60 degrees F, and the humidity level is just under 80%. I cleaned the temperature sensor as suggested by Helen804 and reinstalled it in the sensor receptacle, with no change in operation. Frigidaire says they won't help me because it was not plugged directly into an outlet, and they think my control panel is burned out. That makes no sense to me because of the heavy duty cord I am using. I also note that the compressor turns on, which suggests that the control panel is working properly. The compressor gets hot, but not too hot to touch. The condenser coils are corroded, with lots of rust on the steel parts. I think the unit is out of refrigerant. Can anyone confirm or refute my suspicion? ... if the compressor is running but you have no cooling, it is a goner. Thank you, Hiroshi Anjin-San. Is it a goner because of a failed control panel or because of a lack of refrigerant?